Welcome to the 28th issue of "Shut Up and Mangia!". This special Thanksgiving issue will focus on a traditional dinner with Italian accents. Since this is one of the most celebrated holidays of the year I decided to make this newsletter in two parts. This is an American holiday, so along with the traditional turkey and stuffing I’ve created part two which shows some recipes that Italians have brought to the holiday table. Thanksgiving is a day to celebrate family, friends and food. But most of all it’s a holiday that should remind us of the abundance of resources we have available to us. This is the day to give thanks for the many things we all take for granted. Visit my new site "Mia Cucina Pazzo.com". It’s a site I didn’t intend to make but once I got started I couldn’t stop. It’s a fun place where I get to write anything I want and you get to comment on it. So if you get a chance stop by, read and leave comments. From time to time I will be adding new recipes to both sites. 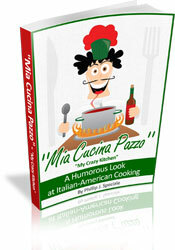 Again I would like to take this time to thank everyone for purchasing my new ebook "Mia Cucina Pazzo". The success of this book means a great deal to me and the feedback has just been terrific. I’m so glad everyone’s enjoying the book as much as I’ve enjoyed writing it. If you haven’t downloaded a copy of "Mia Cucina Pazzo" for the Holidays, just click here and you will be able to view the full table of contents before purchasing. Time permitting the next two site I will be working on are “Imangia.tv”, the video sharing site for Italian recipes, and “The Italian Food Network.com”, which will feature live cooking demos. These two new site will take more time than I first anticipated and should be ready by the Spring. Here are two books featuring some great Thanksgiving recipes. The first book, Thanksgiving (Williams-Sonoma) by Michael McLaughlin, features easy to prepare recipes you can add to your Thanksgiving day table. The second book is another Williams-Sonoma favorite, Thanksgiving: Festive Recipes for the Holiday Table (Williams Sonoma Kitchen Library) by Chuck Williams, is filled with both traditional and new recipes that will please your family and friends for the holiday. A fun Thanksgiving site I found that features crafts, recipes, ecards, etc. is Holidays.net. This site will keep the whole family busy for the holidays. Enjoy! Here is a list of the featured recipes for this holiday. Part one is traditional family recipes. First is the Roast Turkey then followed by Turkey Gravy, Simple Onions, Celery and Sage Stuffing, Fresh Whole Cranberries, Fresh Whole Cranberries, My Famous Garlic Mashed Potatoes, Creamy Green Beans and Mushrooms and Pumpkin Pie. Part two of this newsletter features Antipasti Salad, Stuffed Artichokes, Meatballs, Meat Sauce, Stuffed Shells, Butternut Squash Risotto and Chocolate Hazelnut Biscotti. This should be enough to keep you full for a while. Just click herefor my traditional family recipes. Or, Here for part two Italian recipes. Enjoy!